Happen to be subscribed to Rhapsody and own an Android tablet? Then today is your day! 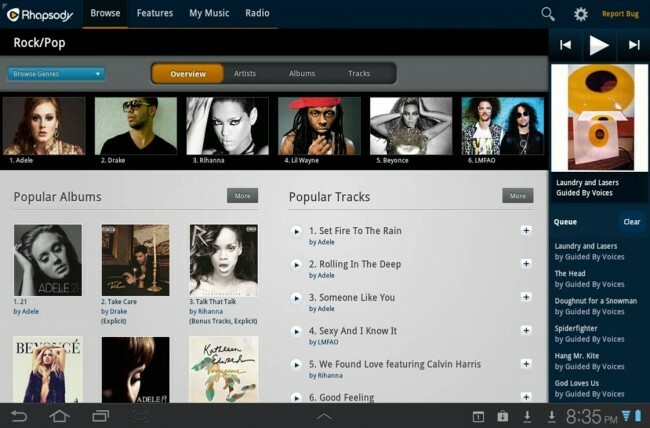 After a long wait, Rhapsody has released a completely redesigned and overhauled application for 9″+sized tablet users. With the redesign, you will notice a magazine-style layout which makes finding your favorite tracks out of the 14 million+ they have available a whole lot easier. – App is free, service is $9.99/month for unlimited listening on your phone, tablet, computer or via connected devices like Sonos. The application is free, but you will still have to pay Rhapsody’s $9.99 a month fee. For some folks, that’s nothing if you enjoy listening to whatever song you want from wherever you are.